This 10-Spool Thread Stand snaps securely in place on to the machine to provide 10 vertical spool pins for thread delivery or bobbin storage. The spool pins can easily be removed to accommodate a variety of spool sizes and a variety of projects. Simply place your threads in the proper color sequence for your next project, and enjoy spending less time changing threads, with easy access to frequently used thread colors. Each thread has its own thread guide to deliver thread smoothly to the machine. 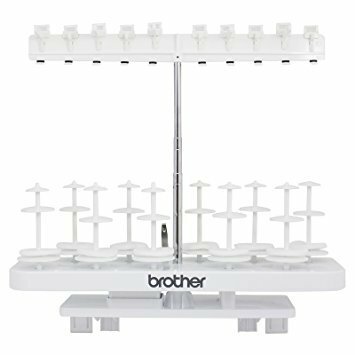 This thread stand also has special slots next to each spool, to keep the thread tails of your spools neatly stored, when not in use.